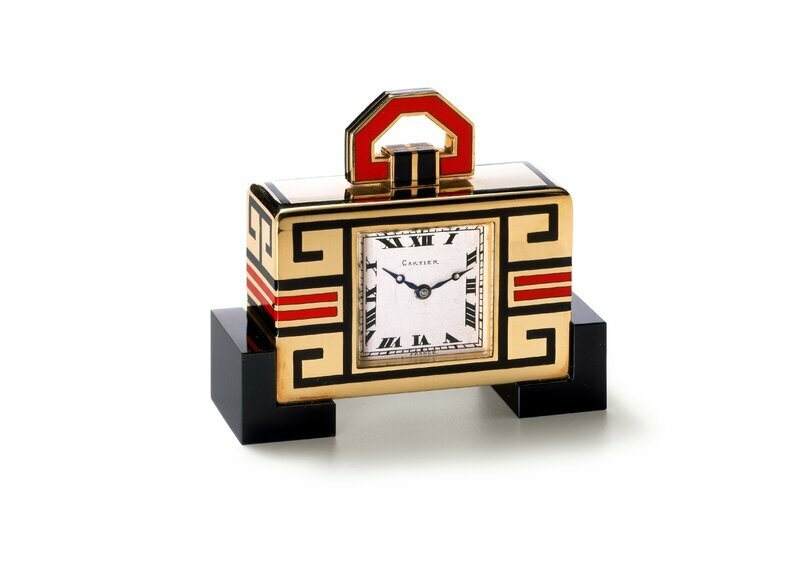 Cartier New York, Desk clock, 1928, gold, enamel, onyx, Cartier Collection. Sold to Mr. H. F. McCormick. Nick Welsh, Cartier Collection © Cartier. This autumn’s Art Deco – Paris exhibition at the Gemeentemuseum Den Haag will include 35 masterpieces from the Cartier Collection. All are items of jewellery or valuable objets d’art dating from the 1910 to 1930 period and perfectly illustrating the opulence and taste of the Art Deco era. They reflect the modern lifestyle of a period when fashionable women habitually carried ‘vanity cases’ and wore ravishing jewellery when they went out on the town. The vanity cases were filled with the latest cosmetics, such as compact powder and lipstick, all beautifully packaged by Cartier in, for example, gold, enamel and laque burgauté, set with gems. One of the highlights of the exhibition is a vanity case adorned with Cartier’s celebrated icon, the panther. Several of the pieces in this exhibition were shown at the renowned Exposition Internationale des Arts Décoratifs et Industriels Modernes, held in Paris in 1925. The term ‘Art Deco’ derives from the title of the 1925 exhibition, at which Cartier showed no fewer than 150 pieces. The firm deliberately chose to exhibit its jewellery in the Pavillon de l’Élégance, because that was where the great contemporary couturiers were showing their creations. 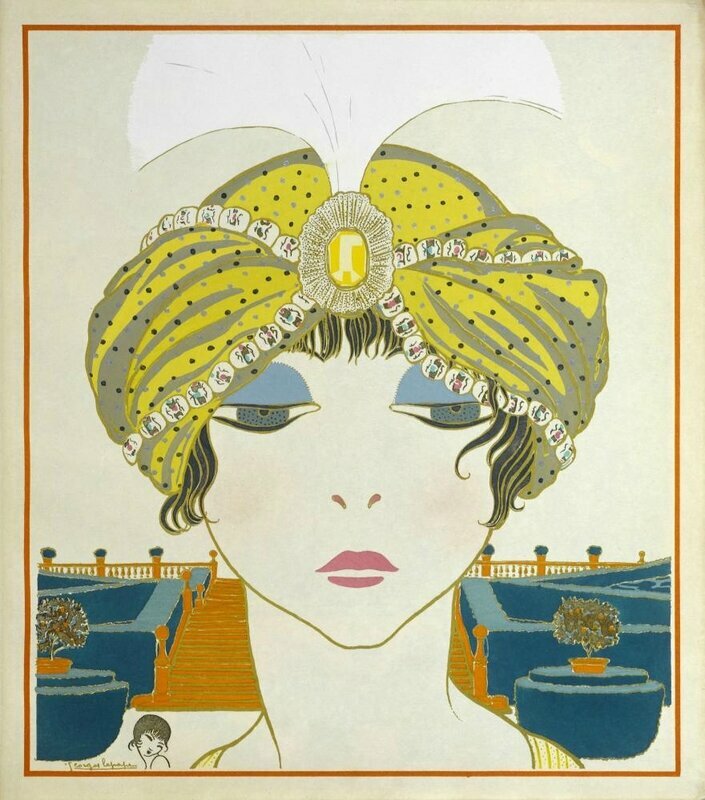 Amongst them was Paul Poiret. One of the great innovators in the world of early twentieth-century fashion, he played an important and inspirational role in the development of the highly decorative and luxurious Art Deco style. The basis for it had been laid as far back as the 1910s. The exhibition at the Gemeentemuseum Den Haag will include creations by the renowned couturier side by side with works by artists of his world: Paul Iribe, Georges Lepape, Erté, Benito, Raoul Dufy, Man Ray, Kees van Dongen, Modigliani, Brancusi, Picasso, Robert Delaunay, André Groult, Mallet-Stevens, the Wiener Werkstätte and the Ballets Russes. The works of art on show will include top-flight pieces on loan from the collections of The Metropolitan Museum of Art in New York and from various collections in Paris, Berlin, Brussels and Monaco. As well as jewellery from the Cartier Collection, the exhibition will include examples of fine art, the decorative arts, fashion, photography and film. 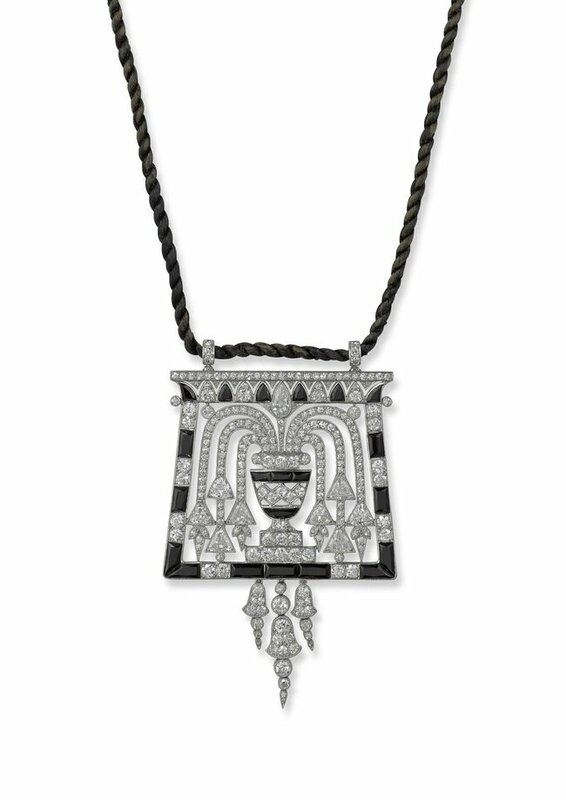 Cartier Paris, Egyptian-style pendant, 1913, platina, onyx, diamond Collection Cartier. - Photo: Vincent Wulveryck, Cartier Collection © Cartier. The decadence and luxury of the fascinating Art Deco period will be brought completely to life in Art Deco - Paris. Visitors will step right back into the world of the ‘Roaring Twenties’ (or the années folles as they were called in Paris): a period personified by Poiret, nicknamed Le Magnifique. While Cartier’s jewellery displays trends similar to those apparent in the fashion and fine art of the time, the Maison had certainly led the way in this respect. For example, although Egyptian influence increased following the discovery of the tomb of Tutankhamun in 1922, it had already been a feature of both fashion and high-end Parisian jewellery for some time before that. A few years before that discovery, Louis Cartier (one of the three Cartier brothers then in the family firm) was buying Egyptian antiquities with a view to integrating their features into his designs. Similarly, Charles Jacqueau (who worked for Cartier from 1909 onwards) was influenced by the Ballets Russes to experiment with new oriental forms and colour combinations. The combination of blue and green gemstones evoked peacock feathers and for that reason historians have referred to it as the ‘Peacock style’. The exhibition will be accompanied by a lavishly illustrated catalogue (in Dutch and English), published by Waanders & De Kunst and authored by various curators at the Gemeentemuseum Den Haag. The Gemeentemuseum is preparing this exhibition in collaboration with EYE Amsterdam. 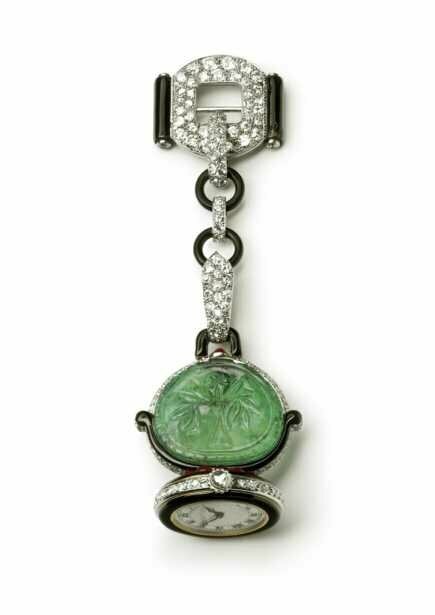 Cartier London, Seal watch-brooch, 1925, platinum, gold, enamel, onyx, emerald, rubies, diamonds Cartier Collection. Nick Welsh, Cartier Collection © Cartier. 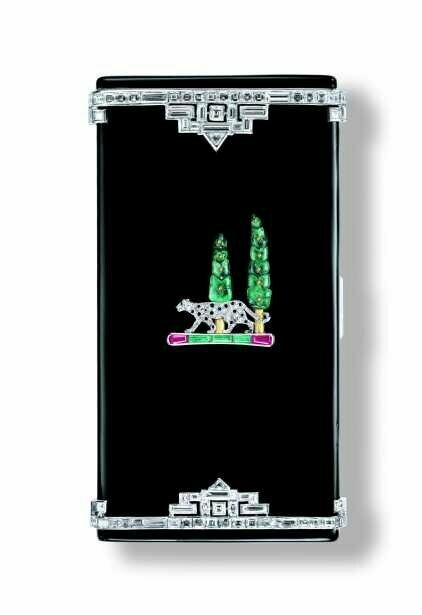 Cartier Paris, Panther vanity case, 1927, gold, platinum, enamel, onyx, emeralds, rubies, diamonds Cartier Collection. Nils Herrmann, Cartier Collection © Cartier. Cartier Paris, Bracelet, 1925, platinum, diamonds, coral, onyx Cartier Collection This bracelet was one of the items displayed by Cartier at the famous 1925 Exposition Internationale des Arts Décoratifs et Industriels Modernes.